It’s January 27. 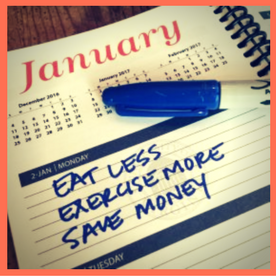 How’s that New Year’s Resolution working out? According to a couple of brainiac professors at U.Va. and the University of Zurich, most of us have higher expectations that we can successfully take on a new goal when it syncs with a new time period. Apparently, it doesn’t matter whether we want to drink less, hit the gym more, or stop gossiping, we figure that our chances for an effective launch are better if we start on the first of the year. Or the month. Or even, actually, on a Monday. Trouble is, just having a fresh start doesn’t mean that the same old temptations and obstacles won’t pop up. You can read the U.Va. findings by clicking here, but if what you really want is some Divine help, why not ask for it? The Bible says that God’s mercies are new every morning (talk about a fresh start! ), and that it is his grace that teaches us how to live wisely and well. 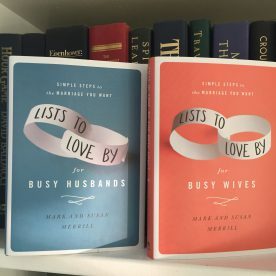 Earlier this month, I told you how much I like Mark and Susan Merrill’s books, Lists to Love By for Busy Wives and Lists to Love By for Busy Husbands. 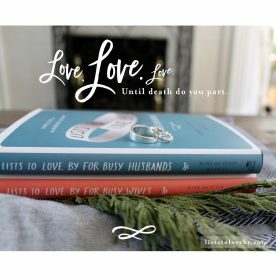 Those are great for strengthening marriage, but what about all the other relationships in our lives? What about our other family members? Or our friends? 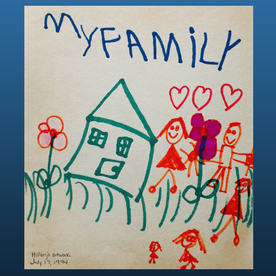 How can we improve connections and strengthen ties with our parents, siblings, and in-laws? What about teammates and coaches…or that tricky roommate…or the co-worker who always seems to find a way to pinch our last nerve? 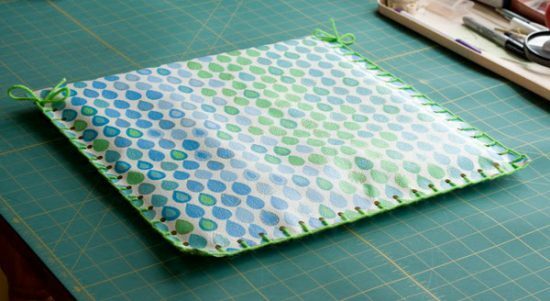 We made them – lots of them – to take along on our Big Camping Trip. But, for reasons that were never entirely clear to me, we never actually went camping. We went to the library. Where the sit-upons worked just fine. All of which is to explain why I can read, but I cannot build a fire. The closest I ever came to having to build one for myself was in college, when a few girlfriends and I decided to skip the mayhem that was Fraternity Bid Night and go camping. Armed with a tin of Jiffy Pop and a bottle of wine, we drove to the outskirts of Charlottesville, parked our car on the side of the highway, and started hiking. Never mind that we didn’t have any wood (or, for that matter, any sit-upons); we had an entire semester’s worth of unread Wall Street Journals we’d subscribed to for an Investments class, and they burned remarkably well. 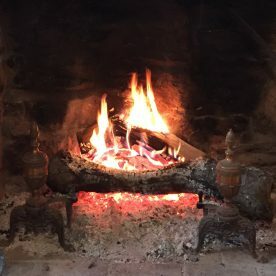 All of which is to further explain why, when it got cold this year and I threw a log into the fireplace, my husband looked at me like I was crazy. Robbie grew up on a farm. He lived in a drafty old stone house with charming fireplaces that a smallish person can actually stand up in, and his fire-building prowess (coupled with his ability to drive in the snow, which no boy I had ever dated could do) had me smitten from Day One. And so, when he said I needed more firewood, I knew better than to challenge his wisdom. I added more logs. If we are made in God’s image, and He is three persons – then at our fundamental core we are made for community. I know Tim Keller is a big City Boy now, but I’m guessing that he has been camping. Or that he grew up on a farm. Because even though he doesn’t come right out and say it, I think what he really means is that people are like firewood. We can sputter along on our own, but if we want to realize our full potential – if we want to burn brightly and well – we need to spend time with other people, people who will ignite our faith and kindle our understanding of God and his purposes. People with whom, and through whom, we can get to know Jesus better. Two are better than one. We are created for community. And friendship, I think, is a blessing that God wants to give us. Sometimes, though, the connections he ordains don’t look like we think they will. Be alert to the unexpected, life-giving friendships that might be in store for you this year. And don’t be afraid to pursue them. Perhaps you know an older person who loves the Lord, and who might be willing to mentor you in the coming year. (It can’t hurt to ask.) Or maybe your church has a Bible Study or an Alpha Course you could join. Or maybe you’re feeling ambitious enough to start your own group. You could invite a few friends to come over and try one of Rick Warren’s Bible Study Methods, or maybe do one of the online studies offered by the gals at Proverbs 31 Ministries. And wait. I just had another idea. January is a often a time for reflection. For evaluation. For looking back…and, even more, for looking forward. For me, it’s a time when I think about things like work and purpose. 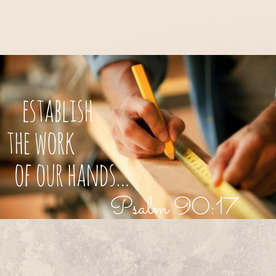 I want to be sure I am investing time and talent the way God wants in the year ahead, and I want him to help me get the job done. 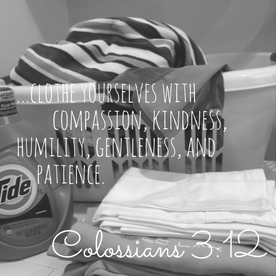 Partly to break up the monotony, and partly to attach some sort of meaning to an existence that seemed to be measured in soccer games and grass stains, I started using the laundry cycle as a prayer prompt. I looked up a few verses about clothing and pressed them (a-hem) into service.